Most canes are made of hardwood ranging in diameter from 5/8" (1.6 cm) to a full 1 (2.5 cm). Canes are available in a wide variety of shapes and styles. Men will be more comfortable with having a larger handle or crook. Women's canes are generally smaller in diameter with a smaller handle. Fitting a cane requires some measuring. The cane handle should be even with the hip joint (greater trochanter). Non-adjustable canes can be cut at the lower end to suit the individual, Remove the rubber tip, mark the correct length and cut with a saw (a tube cutter, instead of a hacksaw, is recommended for aluminum canes). 1/4" should be taken into consideration for the thickness on the bottom of the tip. The client's elbow should have a 25 to 30 degree flex. There are a few basic styles of Quad canes to choose from. The most popular are large base and small base. Quad canes are used by clients who are insecure with a regular cane due to age or frailty, and also used by hemiplegics (clients who are paralyzed on one side but do not require crutches). When using a quad cane, the extended legs should be away from the body. Use the same measuring technique as a regular cane. Cane tips are as important as those on crutches. They are used to prevent slipping and wear and tear on rough surfaces. The cane tip should be wide enough for maximum surface contact. Aluminum canes require tips with a reinforced metal washer inside. Crutches are available in several styles. They are made of wood or aluminum and come in adult, junior and child lengths. They are all adjustable. 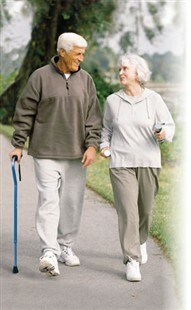 Proper use of crutches is very important ' The user's weight is borne on the hands, not under the arm. The top of the crutch should rest against the chest wall 1-1/2" to 2" below the armpit. The position of the handgrips should result in a 25 to 30 degree flex in the elbow when relaxed. When the user pushes down and raises their weight off the floor, arms should be almost straight. Crutches also require tips with a reinforced metal washer inside. To obtain the required overall length of the crutch follow these steps: 1 . Measure two inches (5 cm) to the side of the foot at toe level. Mark this point. 2. From that point, measure six inches forward, mark again. 3. Measure from under the client's arm to the second mark and deduct two inches (5 cm). NOTE: The client should be standing on a flat, firm surface and should be wearing proper shoes. Finally, for the client's safety, all nuts and bolts should be checked and tightened when measuring is completed. These should also be checked periodically. Forearm crutches are constructed of aluminum, making them easier and lighter to handle. The metal arm cuff encircles the forearm. The cuffs can be front or side opening, and should be adjustable. They are available in youth and adult sizes. When the cuff is properly fitted, the user should be able to use his or her hand without having the crutch fall to the floor. For measuring forearm crutches, follow steps one and two as specified at left (measuring for crutches), then ask the user to clench his or her fist and bend the elbow 30 degrees. Measure from the clenched fist to the second mark on the floor - there is no need to deduct two inches in this calculation. Again, once the measurements are completed, check that the spring lock buttons are securely locked into place.